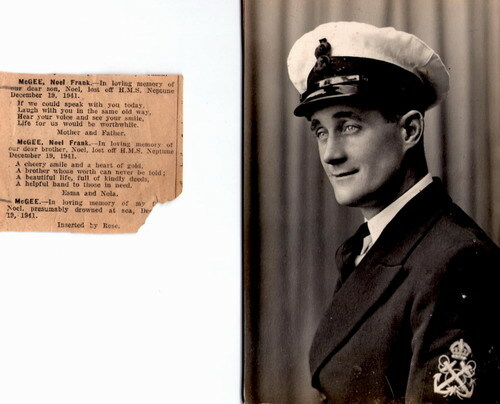 "MCGEE, NOEL F., ENGINE ROOM ARTIFICER"
McGEE, Engine Room Artificer 4th Class, NOEL FRANK, 42. H.M.S.Neptune. Royal New Zealand Navy. 19th December 1941. Age 25. Son of William Leonard and Lucy McGee, of Lower Hutt. New Zealand Naval Memorial , Devonport, Auckland, - North Shore City NZ. Panel 3.